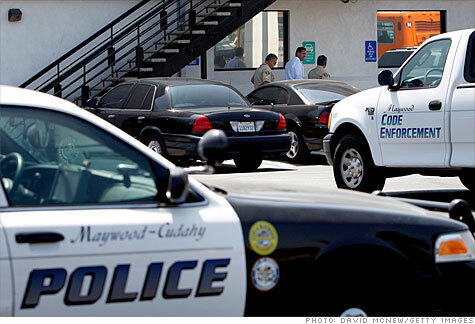 NEW YORK (CNNMoney.com) -- Tiny Maywood, Calif., laid off every single one of its city employees on Wednesday. But that doesn't mean the city is closing up shop. City Hall will still be open, as will Maywood's park and recreation center. Police will continue to patrol the streets. They just won't be staffed by Maywood employees. The city can't have any staff because it can't get liability or worker's compensation insurance for them. Maywood's carrier, the California Joint Powers Insurance Authority, dropped it earlier this month in part because of several police-related claims. Instead of declaring bankruptcy, Maywood officials decided to outsource all city functions. The Los Angeles County Sheriff's Department will patrol the streets, while the neighboring city of Bell will cover other city functions, such as staffing City Hall. Maywood already relies on contract workers and outsources many city services. The director of parks and recreation, for instance, is a contractor, and the city's lights, landscaping and street sweeping are handled by private companies. Los Angeles County maintains the library and fire department. Some of Maywood's 96 employees -- which include 41 police officers -- will also continue as contract workers. Elected officials, such as the city council and the city clerk, will remain on the job in the 1.5-square-mile municipality, which has about 45,000 residents. "Odds are residents will see the same faces as in years past, just under a different administrative process," said Magdalena Prado, the city's community relations director, who is a contract worker and is keeping her post. Maywood is billing itself as the first American city to outsource all of its city services. In an odd twist, officials say it can provide even better services because the shift will help it save money and close a $450,000 shortfall in its $10 million general fund budget. For instance, the contract with the sheriff's department costs about half of the more than $7 million spent annually to maintain the Maywood police department, Prado said. And patrols will be increased. "Our community will continue to receive quality services," Mayor Ana Rosa Riso said in a statement. "Maywood's streets will continue to be swept, our summer park programs will continue to operate and our waste will be collected and hauled as scheduled." A growing number of cities are looking to contract out or share services regionally as the economic downturn takes its toll on municipal budgets. "Everything is on the table," said Chris Hoene, research director at the National League of Cities. "The fiscal stress cities are feeling mean they are looking for alternative options to deliver services that cost less money." Some 7 in 10 city officials said they are cutting personnel to balances their budgets, while another 68% are holding off on capital projects, according to a survey the league did in May. More than half of respondents say they will make to further slash city services next year if taxes or fees are not raised. Not everyone is distressed by Maywood's unusual plan for providing city services. While Jesus Padilla feels sorry for the workers being affected, he thinks things might improve. He's made lots of calls to the county sheriff's department when he worked as a security guard and said officers always responded promptly. "The council made the best decision it could," said Padilla, a local activist who has lived in Maywood for more than 30 years. "It's going to be good for the city and the citizens." Is there a muni bomb in your portfolio?